Well, another day has about gone by, but I haven't had my baby yet. I am in labor right now and hope to have my new baby in my arms tomorrow. I was able to get the sketch card done for the challenge this week over at 2sketches4you. Here my take on this week's sketch. 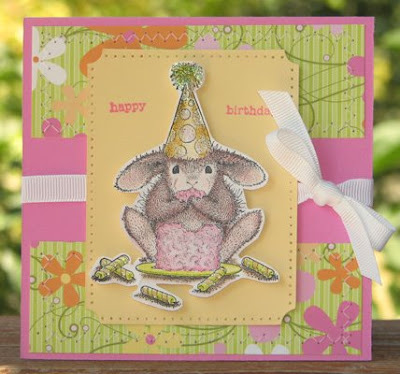 I used Stampin Up for the cardstock and the happy birthday stamps.....the bunny image is House Mouse and colored with the MCPT and prismacolor pencils. I raised the stamped image with foam adhesive. I am not sure of the patterned paper (it is leftovers in my stash) and the ribbon is some I bought from QVC and don't know the brand. 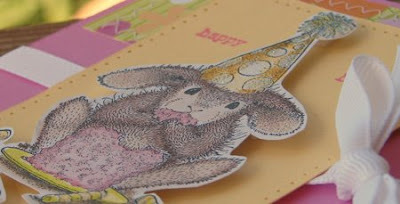 I applied Stickles Glitter Glue to the stamped image. Very cute! Now THAT's the way to be in labor. Sending you hugs and good wishes! oh Amy this is so stinking cute. I love how you interpreted the sketch and this is definitely a 2S4Y first: Let us know as soon as your new little one arrives so we can extend our welcome. Oh, wow, has the special package arrived yet? I hope so for you! Lovely card by the way. Now that is dedication....scrapping during labor! Hope you are holding your sweet little one now! Your card is super adorable! Great job with the sketch! What a cute card! Love it!!! Hey I know that card! It's sitting on a shelf in my craft room :) Thanks so much Amy, I love it.